Microsoft Dynamics NAV project planning is your day-to-day business? Moreover, you enjoy working with the the Visual Jobs Scheduler (VJS), the Gantt chart add-in for Microsoft Dynamics NAV, since it lets you visualize your jobs, job tasks, job planning lines and resources in a straightforward and uncomplicated manner? Then you'd surely love to see how you can use the VJS in an even more effective and practical way. Read this blog post to learn how to directly start the VJS from a NAV page already containing specific filters or jobs. This way, you can bypass the filter request page popping up when starting the VJS the usual way, saving you from re-entering the filter settings you have already made. This should enable your users to start the VJS with data that is meaningful for the task they currently work on. 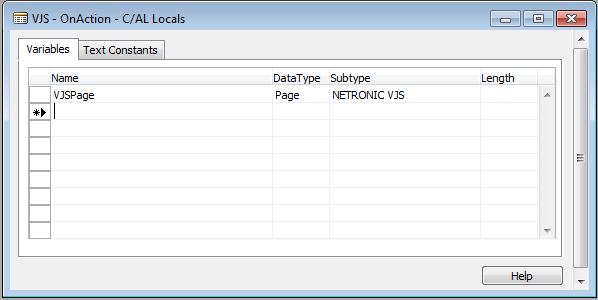 Follow the steps as described in the next paragraph to create the function on the VJS Page first. Open the properties by right-clicking on the row and set local to No. Mark the new function and click the Locals button. Now that you are done on the VJS Page you can open the page from where we want to start the VJS and proceed according to the below examples. In this example, we will add an action to the Page 88 “Job Card”, so that the VJS will show only the job in the Job Card. Design Page 88 “Job Card” and click View -> “Page Actions” (Ctrl + Alt + F4). Now add a new Action to the page. With the new action marked press F9 or click View àC/AL Code. The VJS only passes filters used on the job Record so to get a job Record with filters on it we need a local variable in our new action. We also need a VJSPage variable to call our new function and to RUN. 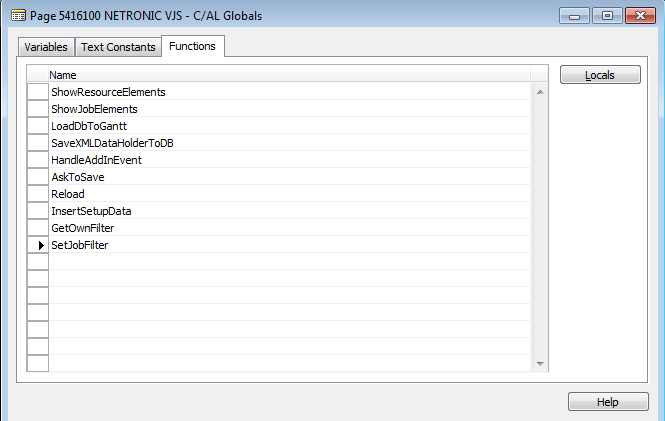 Click View -> C/AL Locals to open the Locals dialog for the action. Here you can add the two needed variables. With that, the action will put a filter on our local job variable, so that the “No.” field is the same. 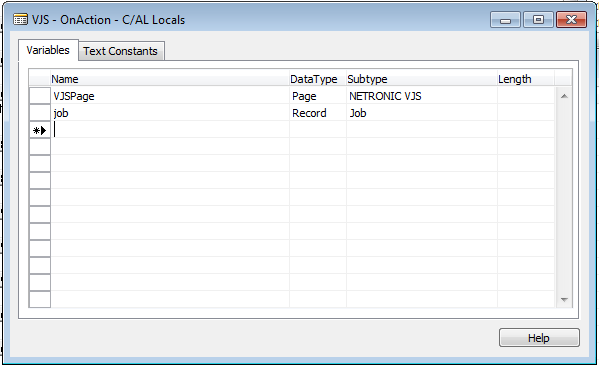 Then it passes that filter on to our new VJS function and when the page is run, the filter is used to load only that one job Record. Please note that Jobs with “completed” status will not be loaded by default! In this example we will add an action to the Page 89 “Job List”, so that the VJS shows the jobs that are shown in the list. Design Page 89 “Job List” and the click View -> Page Actions (Ctrl + Alt + F4). The VJS can use the filters set in the “Job List” Page so we only need a VJS Page variable to call our new function and to RUN. 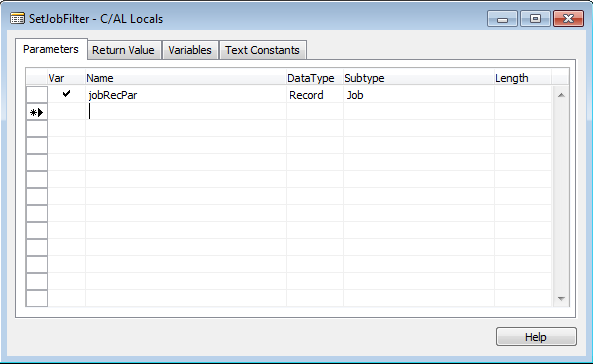 Click View ->C/AL Locals to open the Locals dialog for the action. Here you can add the needed variable. These code lines ensure the filters currently used in the “Job List” Page to be passed to the VJS. Please note that jobs with completed status will not be loaded by default, but can be activated on the Setup page! Please also note that as of Visual Jobs Scheduler version 1.3, the function SetResourceFilter is available on the VJS Page, allowing to filter resources in the same way.